So I admit it, I watched a couple episodes of The Next Food Network Star. The delightful Aarti won- of the new show Aarti’s Party. I’ve only watched a couple eps of her show, but this is one of the recipes I saw. When you’re trying to eat a lot of vegetables– sometimes salad gets a little boring. Roasting vegs is a great way to jazz them up and mix up the flavor. I went a little root vegetable happy in the co-op and added parsnips, rutabagas and turnips to this recipe. I’d definitely add the parsnips- what a delicious yet underrated food. The roasted lemons add a huge burst of flavor. Since I added so many extra vegs- I should have added a bit more oil- there is more than enough spice. As to Aarti’s suggestion, I served mine over soft polenta. I never used to be so into polenta- but i am really into grits which, as it turns out, are the same thing in a slightly different form. The polenta I made for this took about 5 minutes– is tasty and filling. A great alternative to putting everything over couscous. In a small bowl, whisk together the ground cumin, ground coriander, and olive oil. Add 1/2 teaspoon salt and a generous grinding of black pepper. Put all the all veg and lemons in a baking dish. Pour the spiced oil over the vegetables and toss to coat. Bake for 30 minutes. 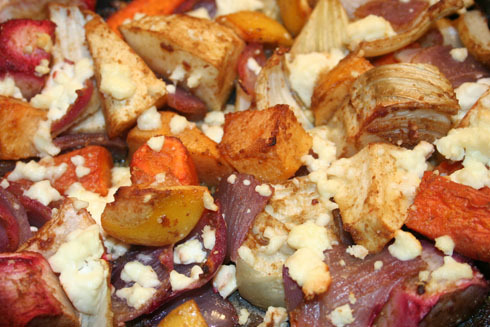 Sprinkle feta cheese over the top and bake until the vegetables are caramelized and soft, another 15 minutes. 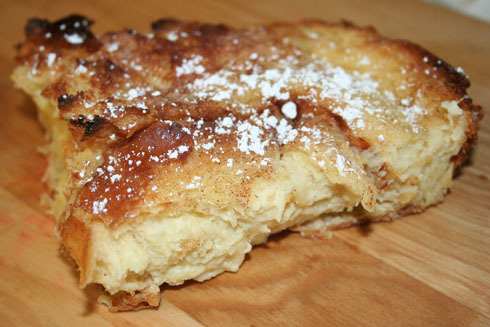 This french toast is just too good. For many years- I have loved the french toast at Jane. And this dish- I think I explains how they get that melt in your mouth middle part. The key- like the breakfast casserole- is to let it soak overnight. Doing it the night before also leaves less to worry about in the morning- and you don’t have to deal w. making it in batches and keeping them warm. This recipe comes from Smitten Kitchen. For flavoring, I used 3 tablespoons Bailey’s and 2 teaspoons Vanilla extract. I was tempted to scrape a vanilla bean in there- I didn’t- but next time definitely will. SK uses 3 tablespoons of Bailey’s and 3 tablespoons of Cointreau. She also says Frangelico, Chambord, Creme de Cassis, Grand Marnier or a teaspoon or two of vanilla or almond extract work would. And, that you can add some zest, chopped nuts (almond or pecan), raisins or some such if you want. Now, I didn’t serve it with this- because i didn’t think of it- but I am including the Clinton St. Baking Co. recipe for Maple Syrup Butter (cribbed from the cookbook Mara got when she hung out w. Stavros- the greek shipping heir who used to date Paris Hilton). This syrup is also the first thing I’m putting on here that I haven’t actually made- but how can it be bad? This french toast doesn’t really require syrup- but because it just sounds so damn awesome, I wanted to include it. Throw those balsamic berries on it while your at it. Would be a killer brunch. +whatever booze/flavor combo you want. I did 3 tablespoon Baileys + 2 teaspoons vanilla extract. 1. Generously grease a 9×13-inch baking dish [i used a smaller one] with salted (my choice) or unsalted butter. 3. Whisk milk, eggs, sugar, salt and booze or flavorings of your choice and pour over the bread. Sprinkle with cinnamon and sugar. 4. Wrap tightly with plastic wrap and refrigerate overnight. The bread will absorb all of the milk custard while you sleep. 5. Bake at 425 for 30 minutes, or until puffed and golden. This will take longer if you have additional layers. 6. Cut into generous squares and serve with maple syrup, fresh fruit, powdered sugar or all of the above. Maple Butter from Clinton St. Baking Co.
Heat syrup over medium heat. Whisk in butter one cube at a time. 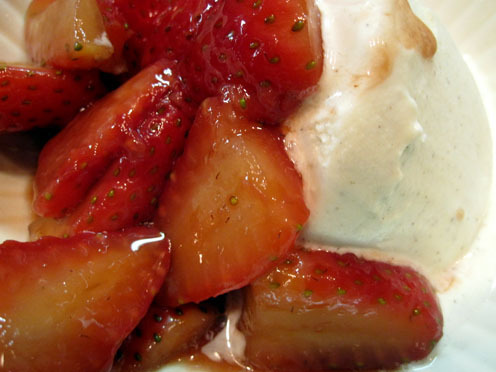 mmm… balsamic strawberries. This combination might sound a bit unusual but man, it’s so good. The vinegar is not overpowering– but it does something somehow– so it tastes more like a strawberry sauce. I went over to my sister’s house on Monday- and when I told her what I was making for dessert, she was not enthusiastic. But, she tried it, and has these words to add: “so basically, i thought this would be disgusting. i really don’t like balsamic vinegar. but since monday- i’ve had a one track mind- and i’ll i can think about is eating more of them.” This is great to serve when having people over- because it is no cook- you just mix it up- and let it sit. It is especially delicious over vanilla ice cream. I had leftovers (which keep surprisingly well) in greek yogurt. Also good on its own- or i imagine it would be bomb on top of pancakes/french toast. This is an Ina recipe- she has it for breakfast or on panna cotta. Another good thing, it still works well w. out of season berries. The recipe easily cuts in half if you only have one pint. You can’t mess it up. Cut strawberries. Mix all this in a bowl. Set aside at room temperature for 30 min to an hour before serving. Stir every now and again. This gives them time to get syrupy and delicious. This is a dish from Roey- who has known my parents since back in their fire island share house days. Roey makes a killer brunch- best served on the deck of their beach house. 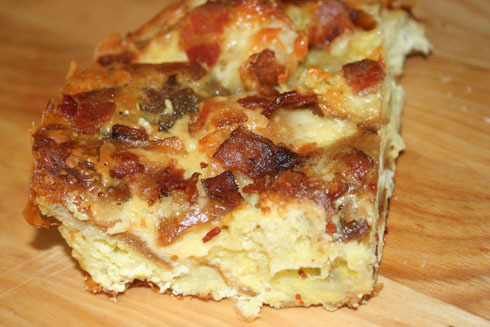 This egg casserole is so golden- because it tastes almost like super eggy french toast with bacon on top- best of all breakfast worlds. Leftovers freeze surprisingly well. And yes, it is important to soak it overnight- this is what gives it the bread pudding type texture. I love that aspect though- less prep work in the morning. Bake next morning at 350 for one hour-covered for first 50 minutes then uncover for 10 mins. A note on Bacon- for this purpose- I think it’s easiest to cook the bacon in the oven. This time, I decided to use a cooling rack above a cookie sheet so the grease could drip down. But, I think it would be fine just on a cookie sheet. Line the sheet with foil! And you put the bacon in while oven is cold- don’t need to preheat ahead. I did it from maybe 17-20mins mins at 350. But next time, I’d go up to 400 and cook for 10-12mins. Keep a close eye on it towards the end. When done, blot w. paper towels- or put on a plate lined w. paper towels. This is a Doris Greenspan recipe. I bought her cookbook this summer and paging through it, this recipe didn’t really jump out to me. But Melissa brought these to Techluck (BM tech dept’s weekly vegetarian potluck), and I was impressed. 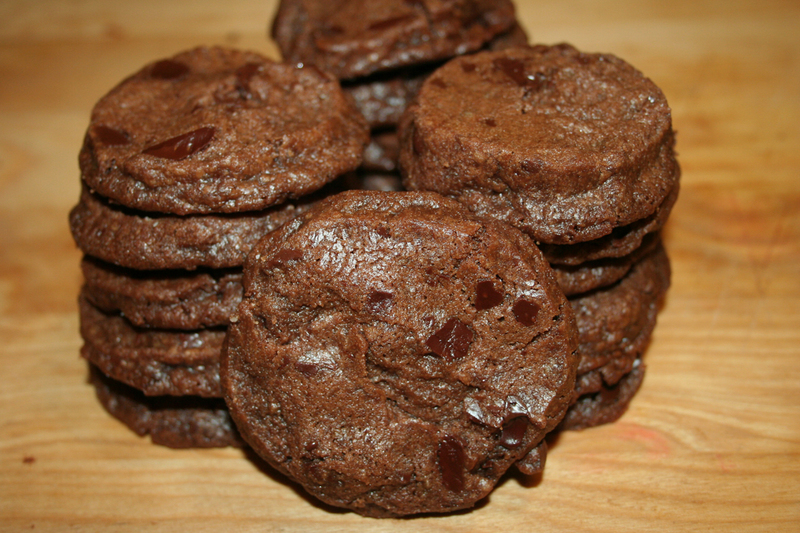 I am usually not into chocolate cookies—but these don’t really taste like it. They taste more like shortbread- with melty chocolate bits in it. Check out my new section- Just the Tips– for tips on shaping the dough into logs. Doris uses a paper towel roll to help the log keep its shape in the fridge. If I was just refrigerating it- I would have followed Melissa’s lead- and instead of using this method, just flatten all sides and make square cookies. But because I was freezing the dough- I used the paper towel roll method. It was actually very easy because dough so crumbly and dry. This was my first time freezing dough, and I wasn’t sure how it would compare– but it worked like a charm. Working w. a mixer, beat butter on medium until soft and creamy. Add both sugars, the salt and vanilla extract and beat for 2 minutes more. Pour in flour mixture. Can cover w. a kitchen towel so the flour doesn’t fly. Pulse mixer at low speed about 5 times, a second or two each time. Look at it—still lots of flour pulse a couple more times; if not, remove the towel. Continuing at low speed, mix for about 30 seconds more, just until the flour disappears into the dough — try to work dough as little as possible once the flour is added. It’s ok if dough is crumbly. Toss in the chocolate pieces and mix only to incorporate. Getting ready to bake: Center a rack in the oven and preheat the oven to 325° Line two baking sheets with parchment or silicone mats (i fit mine all one way baking sheet- something i consider a major bonus). Working with a sharp thin knife, slice the logs into rounds that are 1/2 inch thick. (The rounds are likely to crack as you’re cutting them — don’t be concerned, just squeeze the bits back onto each cookie.) Arrange the rounds on the baking sheets, leaving about one inch between them. Bake the cookies one sheet at a time for 12 minutes — they won’t look done, nor will they be firm, but that’s just the way they should be. Transfer the baking sheet to a cooling rack and let the cookies rest until they are only just warm, at which point you can serve them or let them reach room temperature.